An early Sunday morning calls for a podcast! I have this tendency to wake up too early in the morning… even on weekends. And then I can never fall back asleep. So I suppose an early riser, like myself, should be more productive because there are only so many hours in a day. 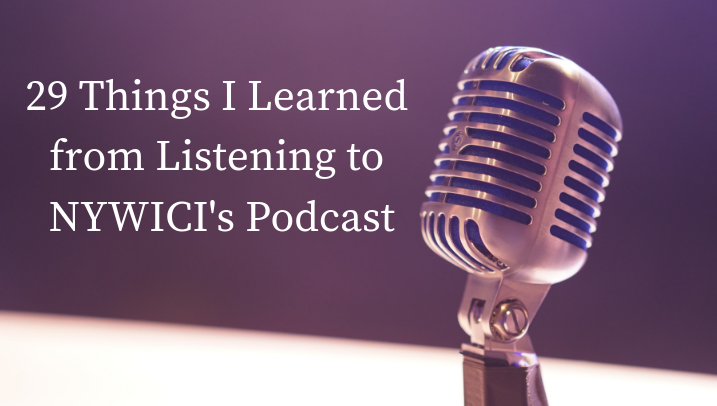 Here are 29 things that I learned from listening to NYWICI’s Coffee Break Podcast on Soundcloud. It’s also available on iTunes, if anyone was wondering. Just a word of warning, there is no coffee. You have to bring your own. Be compassionate. This means always trying to understand where others are coming from. Everyone has a different perspective depending on their walk of life. And not everyone has walked the same steps as you. When it comes to working on a project with a team, understanding is key to communicating effectively. Spend wisely. Not only is saving money very important, but you have to make sure that you buy things that matter. It’s all about priorities! Have your parents ever told you to “save for a rainy day”? Yea, I’ve heard it plenty of times. And honestly, they were so right because you never know when it’s gonna rain or how hard. Be prepared! It’s your job and you can cry if you want to. Ask the right questions. Always ask questions that are positive, focus on improvement, and make your intentions clear. Complaining about something doesn’t make it go away. It’s okay to say no sometimes. Know your limits. If you’ve already got a heavy workload and can’t possibly take on another task, don’t accept another assignment. Now what you shouldn’t do is take on that one extra project, and when you don’t meet the deadline, use your heavy workload as an excuse. Sounds real basic, but everyone is intuitive enough to figure things out on their own. And the more you figure it out on your own, you’ll become more self-sufficient. Be social… even when you don’t have time. An hour long coffee meetup is good for catching up with friends and/or colleagues. Even if you don’t completely have your sh*t together, just try to make it look like you do. This can be easily done by not complaining, and instead, staying positive. Change that “I don’t have a couch and I’m still sleeping on a blow up mattress” to “Just ordered my new couch and I’m working on picking out a mattress.” But at the end of the day, it is okay to ask for help from someone that you trust. Communicate with people. It’s so important to meet new people and keep in touch with your circle. If you’re only using a relationship with someone to get something out of it, then it’s not an authentic relationship, and the other person will feel it too. #SquadGoals!!! This is so true. Someone wise once told me: “You only need four quarters to make a dollar, not a hundred pennies.” When it comes to friends, and even generally the people you surround yourself with, it’s all about quality. I’d rather have a ton of really good, genuine, authentic friends than a bunch of friends that I can’t trust or connect with. Yes, you should always negotiate your salary and benefits, to the extent that it is merited. Don’t walk into your bosses office after one year throwout your work anniversary like it’s some major achievement. Humble yourself, but know your worth. We talked about taking a day to pamper yourself, but what’s also important is having time to do nothing. That’s right. Take a personal day off from work, sit home, and do nothing. If it’s not to strenuous to press buttons on the TV remote, feel free to veg out on the couch. I know it sounds boring, but just try it. You’ll see what I mean. If you’re not happy, leave. I 100& agree with this statement. I use one weekend out of each month to focus on me. I’m talking Soul Cycle, yoga, body wrap, hair, nails, lunch with an old friend, binge watching my favorite shows, cocktails with the girls later, etc. A weekend of pampering never hurt anyone. Get that side gig started… whatever it is. Mine is blogging and knitting. Invest in yourself. And if not public speaking, maybe take a business writing course. It doesn’t matter what that thing is; just find something that you feel you could improve on and work on it. There is always room for improvement. There will always be something that you want, whether it’s materialistic or lifestyle based. But, if you learn to be truly content with what you have, the never ending wishlist starts to disappear. Take REAL time off. When on vacation or out sick, don’t feel obligated to catch up on work or check if you’re missing out on something. This, alone, will set the tone and make your coworkers think twice about calling you on your day off. While I’m always for furthering your education because it adds value to your personal brand, it’s only a good option if it’s within your financial means. I find that being authentic is the best way to get people to like and trust you, not only in general, but especially at work. And when it comes to your boss, honesty is definitely the best policy because trust is not necessarily a given. It takes time and the only way to prove yourself is to be honest at all times, even when you only got in a few minutes late today or took a late lunch (but you’ll make up the time later, right?). And you' never know… you might be given the opportunity to work from home. I have and am a mentor. I like the idea that I can help someone else who is starting out in their career. But, I’m not that seasoned in mine either, so I like having a mentor to guide me as well.